Preheat oven to 375°F. Using a mixer, cream butter and sugar on medium speed. Add egg and mix until thoroughly combined. 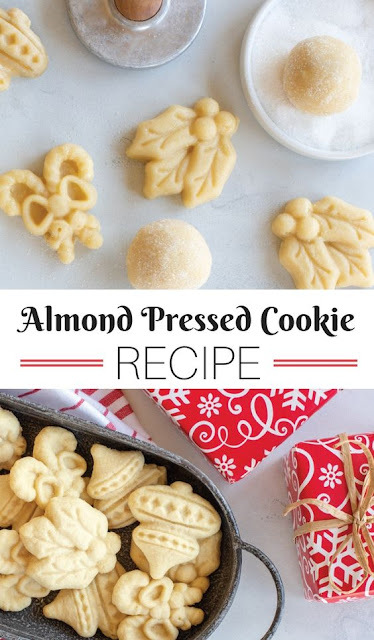 Slowly add flour, salt, and almond extract. Cover and refrigerate for 30-40 minutes. When dough is ready, take 2-3 tablespoons of dough and roll into balls. Place in bowl of sugar and completely coat. Place on cookie sheet and press with holiday cookie cutter designs. Trim away excess dough around each design. Bake cookies for 8-10 minutes or until set but not browned. Cool cookies on cooling rack and repeat with remaining dough. Decorate as desired. Makes 2-3 dozen cookies.